January 9, 2017 – This week, our time machine whisks us back the Pan-American Exposition, a Gilded Age world’s fair powered by the newly harnessed power of electricity. “The Pan” covered 350 acres near Niagara Falls, and heralded the wonders of the 20th Century. But it also featured lingering stereotypes of a pre-flight world, and the tragic assassination of President William McKinley — America’s most beloved chief executive since Abraham Lincoln. 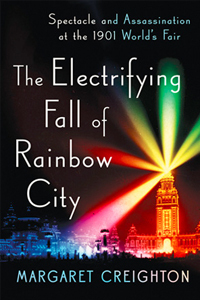 Our guide to Buffalo in 1901, is Margaret Creighton, professor of history at Maine’s Bates College and author of The Electrifying Fall of Rainbow City: Spectacle and Assassination at the 1901 World’s Fair . You may have enjoyed her previous book, The Colors of Courage: Gettysburg’s Forgotten History — Immigrants, Women, and African Americans in the Civil War’s Defining Battle , which was up for the Lincoln Prize. You can find her online at MargaretCreighton.com or on Twitter at MCreight88. And to explore the exposition from here in the 21st Century, visit PanAm1901.org.